Happy Holidays from the NYSADTA Board! **Please note an error was made in the NYS Chapter Board Member Bios section of the Spring Newsletter sent out in April. Our Albany region liaison’s name is Pamela Faith Lerman (last name appeared incorrectly as Robinson). 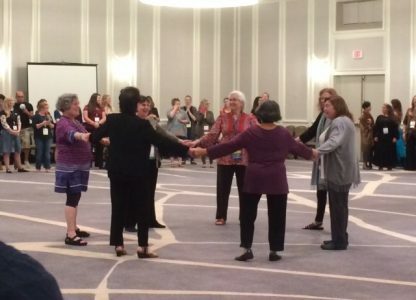 The 51st ADTA Conference was a huge success and a wonderful time to reconnect to colleagues, inspire one another, and invigorate our national community. We are proud that our own Chapter President, Angie (Giordano Adams) Yemma, has taken on a new leadership role at the national level. She now serves on the PR Committee as the ADTA Social Media Manager. Her involvement on a national level will be a wonderful addition to her role as President of the NYSADTA, facilitating increased communication between the state chapter and the national board. In addition, our Hudson Valley Liaison, Sabrina Washington, co-presented with Rev. 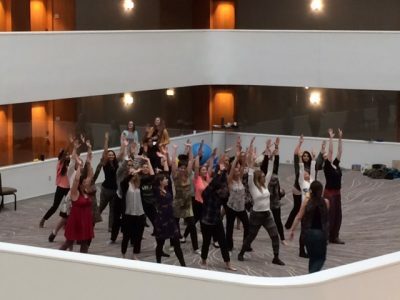 Suzy Meszoly, and provided a powerful session, “The Power of the 7 Energetic Chakras in Dance/Movement Therapy.” Stay tuned for the possibility of an opportunity to experience their presentation again at home in New York for CEUs! As many of you know, there are significant changes regarding LCAT licensure in New York State including new requirements for CEUs beginning January 2017. The specifics of these changes are broken down and explained on the New York Office of Professions website. If you have further questions that are not answered on the website, please feel free to contact the chapter and we’ll do our best to get you the answers you’re looking for. There is a growing list of CEU providers that the website is updating regularly, so please check back regularly. Our chapter is also in the process of applying to become a provider and will keep you posted on our status. In the spirit of inclusivity and belief in information accessibility, we are working toward reaching a larger audience with chapter updates and relevant local information through our newsletter distribution. To do this, we will be publishing our newsletter content on our website’s blog instead of the Chapter’s members-only listserv that our newsletter has previously served. We hope you find this easier and more streamlined. Most importantly, we hope that our chapter continues to serve all NYS dance/movement therapists. Please let us know how we can help you and information that you would find helpful! It has been an eventful and critical fall, both locally (with new legislation passed for NYS Creative Arts Therapists) and, of course, nationally as we prepare for new political leadership. We have welcomed three new student liaisons and a new Information Technology chair! Neha Christopher, formerly, student liaison to our chapter, has graduated from Pratt Institute and moved into the role of IT Chair. We are excited that we have three new student liaisons who are representing both Master’s programs in the state of New York (Pratt Institute and Sarah Lawrence College). We are grateful for their service to the board and their valuable input voicing the needs and ideas of current students. Tia Huston is a second year student at Pratt Institute in Brooklyn. She obtained her Bachelor of Arts from Agnes Scott College in Atlanta, Georgia. She has been living in NYC for the past 6 years. She discovered dance therapy while working as a freelance dancer in NYC and quickly realized it was the path for her. She’s excited to be a student liaison for New York State Chapter of the ADTA, and can’t wait to become a dance therapist. Anita Nichole Lewis is a Brooklyn native and a Brooklyn College alumni with a Bachelors degree in business administration/marketing. With her formal training in ballet and modern, she realized that her interest shifted from performance to the effects of dance on her wellbeing. In her volunteering at the 92nd Y’s therapy and exercise class for stroke recovery, Parkinson’s disease and other neurological physical conditions, she witnessed the growth and improvement of the students as a result of barre exercise, gentle movement and body explorations. Anita is now a second year student at Pratt where she is interning at the Center for Discovery. She hopes to work with kids and seniors with physical frailties upon graduation. Cerezmy is a second year student from Sarah Lawrence College and holds a Master of Arts in Disability Studies from CUNY. Cerezmy’s research is focused on DMT and the use of performance to advocate for social justice. Growing up in the borderland between Texas and Mexico, Cerezmy is also invested in infusing her studies and future practice with cultural awareness as a tool to promote inclusion. CHAPTER POSITION AVAILABLE! JOIN THE NYSADTA BOARD! 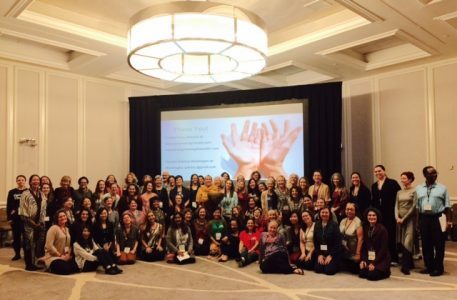 Stay tuned (via this blog, email updates, and our social media presences) for other upcoming chapter events including CEU-eligible professional development workshops and Chapter Meet and Greets!